PROVIDENCE — Three things distinguish an odyssey from other journeys. It must be long, unpredictable, and have home as ultimate destination. Those qualities all apply to Linda Connor’s photographic career. For more than three decades, that career has taken Connor to sites as diverse as the Himalayas, Angkor, Chartres, the Valley of the Kings, Machu Picchu, and the desert Southwest. What these otherwise-disparate locales share is a sense of the sacred. They “remain mysterious, in plain sight,’’ as Connor puts it; and her photographs of them are “an attempt to point toward the unfathomable and the unutterable.’’ The home she seeks — what her photographs aspire to — is that metaphorical place where the unfathomable may be plumbed, the unutterable spoken. “Odyssey: The Photographs of Linda Connor,’’ which runs at the Rhode Island School of Design Museum of Art through Oct. 31, is about home in an additional way. Connor studied at RISD as an undergraduate with Harry Callahan. The show consists of 69 black-and-white photographs. Connor uses a large-format view camera and makes 8-by-10-inch contact prints, which gives her photographs a very fine sense of detail. She exposes the negatives in her garden, using nothing more technologically elaborate than sunshine. Finally, Connor tones the prints with gold chloride. The result is a very distinctive look: dark, almost sepia tinged, yet with a distinct luminosity. Light matters a great deal to Connor, even more than it does to most photographers (which is really saying something). The almost unnervingly beautiful “Moonrise, Clouds, & Star Trails, Lake Tsomoriri, Ladakh, India’’ is like a poem to light. Nearly a quarter of the photographs in “Odyssey’’ are from Ladakh, near the Tibetan border and a center of Buddhism. It’s clearly a touchstone for Connor. For all her love of light, Connor is alert to the power of darkness visually. All the photographs in “Odyssey’’ have dark frames and mattes. The walls are dark, too — brown, almost to the point of purple. The effect isn’t at all gloomy. Rather, it lends the two galleries a sense of repose and gravity. These are not images to hurry past in search of famous faces or incongruous juxtapositions. Further encouraging contemplation is Connor’s putting wall labels at the end of each sequence of photographs, rather than with the individual image. Evocation, not explanation, is her aim. Certain motifs recur throughout “Odyssey’’: trees, circles, entryways, stones. The delicate tracery in “O’hia, Hawaii, 1997’’ is as stark as rain on rock — unlike “Tree Decorated With Ceremonial Cloth, Bali, Indonesia, 1991,’’ which combines nature and culture, the organic and ceremonial, in a single startling image. The circles can be suspended from the ceiling of a Cairo mosque or be the oculus of a Turkish caravansary. No entryway is more striking than that in “Religious Festival, Phiyang Monastery, Ladakh, India, 2005.’’ It’s like a portal to another world. The stoniness of soil, structures, and hills in “Prayer Flag and Chortens, Ladakh, India, 1988’’ (a “chorten’’ is a kind of reliquary) sets off the otherworldliness of the flapping banner and the spirituality it represents. So many of Connor’s photographs seem to stand outside of time. 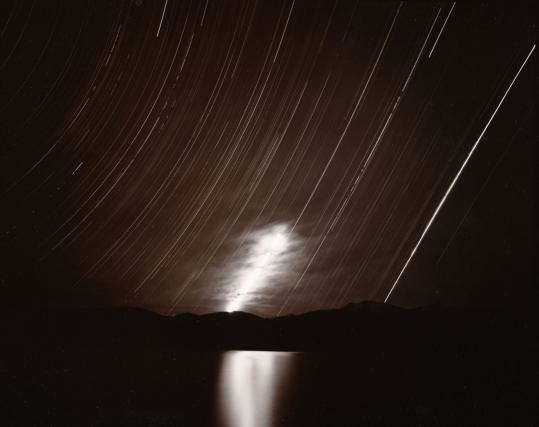 As if to underscore this transcendence of temporality, she intersperses a set of very different images throughout the show: photographs she has taken of 19th-century glass-plate negatives of stars from California’s Lick Observatory. The titles Connor uses are the dates when the original exposure was made: “April 16, 1893,’’ say, or “August 13, 1895.’’ They’re the intersection of time and eternity — or as close to eternity as the non-religious mind can come. As the Lick astronomers were celestial cartographers, so is Connor a spiritual cartographer. Her photographs offer coordinates toward a geography of the soul. They limn an ecstasy beyond passion, an understanding beyond knowledge. Great as is their sense of place — those stones, that tree, there — even greater is their sense of something universal. At: the Rhode Island School of Design Museum of Art, 224 Benefit St., Providence, through July 31, then Sept. 1 through Oct. 31. Call 401-454-6500 or go to www.risd.museum.org.